SqueakAmp is an MP3 player for Squeak that has many of the nice features of WinAmp, and a couple that WinAmp doesn't have. Once you install SqueakAmp, you'll never again need to leave the comfort of your Squeak environment to play your music. Originally envisioned to be used only by me, it turned out to be so cool I decided to polish it up as a goodie for use by the Squeak community. 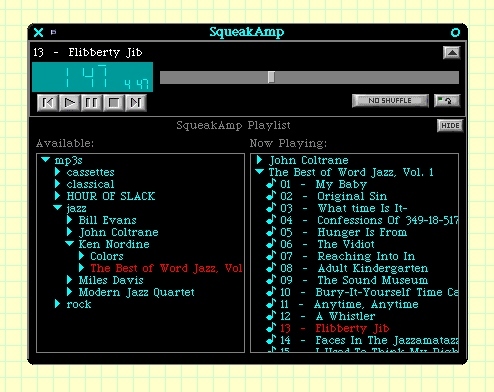 When SqueakAmp starts, you see the full SqueakAmp window, complete with playlists. Once you add files to the current playlist or load a pre-saved playlist, you can save desktop real-estate by hiding the playlists, or you can really go unobtrusive by clicking the "tiny mode" button. SqueakAmp uses the MPEG3Player Plugin, so it should work on any platform that supports that plugin. SqueakAmp was originally developed on Squeak 2.8, and that version is still available for download. If you use it, be sure to download John McIntosh's MPEG3Player Plugin. It has also been ported to Squeak 3.1 (a BIG THANKS to Karl Ramberg for coding up the changes for 3.1-compatible AlignmentMorphs!). Since Squeak 3.1 comes with the MPEG plugin as part of the base image, it is not necessary to download John's plugin files.